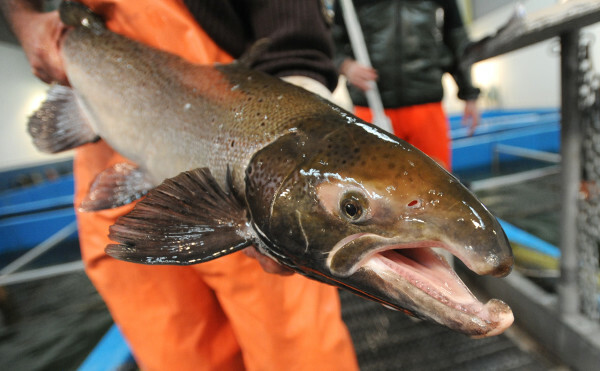 An Atlantic salmon is seen at the Craig Brook National Fish Hatchery in East Orland in this November 2014 file photo. 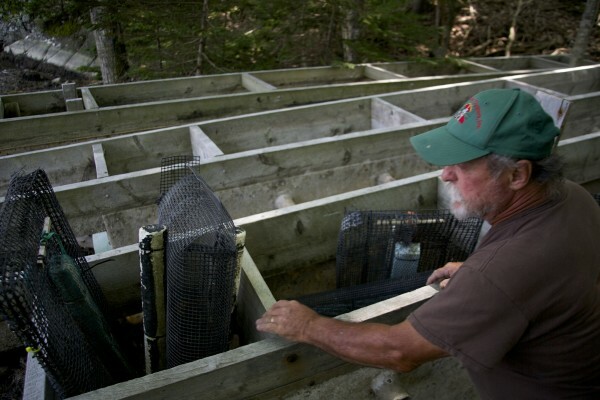 Oyster grower Jesse Leach shows his upweller used as a nursery for baby oysters in Penobscot in this July 2014 file photo. Oyster growing cages line the Bagaduce River in Penobscot in this July 2014 file photo. Maine has seen growth in the number of young farmers and in the value of local agriculture in recent years. But that’s on land. In the water, Maine is a big fish in aqua farming, one of the world’s fastest-growing agricultural sectors. The Pine Tree State ranks among the top aquaculture producers in the U.S., surpassed only by freshwater catfish producers like Alabama and Mississippi. In seawater, Maine is an aquaculture leader. And when it comes to salmon, no state raises more of it than Maine. The U.S. ranks 15th for aquaculture production, behind China, India, Egypt, Vietnam and Japan, among others. In 2011, the U.S. produced 0.8 percent of global aquaculture production, while Asia produced 88 percent. As the global population continues to rise, many expect aquaculture to step in and feed a growing, hungry planet. Indeed, it’s already making a dent in people’s diets. According to the International Salmon Farmers Association, one in five people rely on fish as a source of protein, and more than 50 percent of seafood originates on a fish farm. The Earth Policy Institute reported in 2013 that farmed fish fills more plates worldwide than beef. That means Maine’s fish farmers and would-be fish farmers have an opportunity in a distinctly global agricultural market as more people demand farm-raised fish. Potentially a $100 million Maine industry. The U.S. Department of Agriculture’s 2013 aquaculture census, released late last year, pegged the value of aquaculture in the U.S. at about $1.3 billion. Maine contributed more than $57 million in sales to that total, more than double the state’s 2005 contribution. But according to Sebastian Belle, executive director of the Maine Aquaculture Association, the USDA survey provides a less-than-complete look at the value of Maine aquaculture, which he said is closer to $80 million-$100 million. The reason? The USDA survey included only 35 of the 180 aqua farms in Maine. According to Belle, Maine, Florida and Washington consistently vie for the No. 1 spot for saltwater aqua farm production while Alabama and Mississippi dominate freshwater aquaculture with catfish. But in the past few years, Maine has taken the top spot for saltwater aqua farm production and ranked in the top five overall, for saltwater and freshwater farms, thanks in large part to the Atlantic salmon. 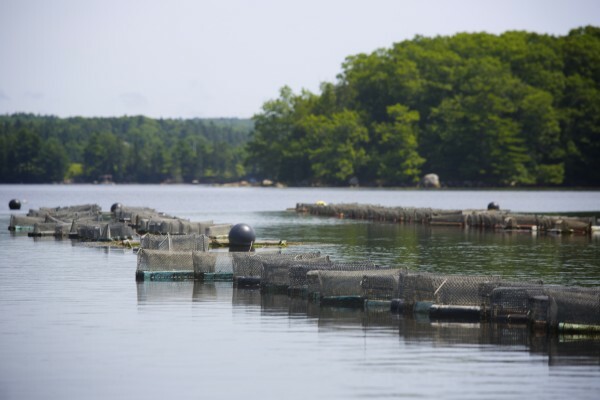 Maine leads New England in fish farming. Even though the USDA’s 2013 aquaculture census provides a less than full picture of the value of Maine’s aqua farms, the census still shows the state leads the pack in the Northeast for aquaculture production. In fact, the value of aquaculture in Maine was greater than the rest of New England put together. The value of both salt and freshwater aqua farm output in the other New England states is: Connecticut, $28.6 million; Massachusetts, $18 million; Rhode Island, $5.7 million; New Hampshire, $759,000; and Vermont, $132,000. Atlantic salmon might be Maine’s farm-raised lobster. According to Dana Morse of the Maine Sea Grant College, a unit of the University of Maine, while production of Maine shellfish such as mussels and oysters has been growing, Atlantic salmon brings in the most money for fish farmers. In 2010, blue mussels and American oysters were valued at $1.3 million and $1.7 million, respectively. Meanwhile, Atlantic salmon was valued at $73.5 million in 2010. According to the National Oceanic and Atmospheric Administration, the value of Maine’s 12,000 tons of farmed salmon in 2013 was nearly $78 million. Washington, the only other state to farm salmon, farmed 8,000 tons of it valued at $52 million. In any given year, Belle said, the Atlantic salmon represents 70 to 80 percent of the value of Maine aquaculture production. Maine could have a role in feeding the world. According to the International Salmon Farmers Association, farmed fish will be key for feeding a ballooning population, which Pew Research Center projects will grow to nearly 9.6 billion by 2050. Already more than half of seafood consumption originates from aqua farms and now outpaces beef consumption, according to the International Salmon Farmers Association. So as many global fisheries have been either depleted or overexploited, farmed fish can ease pressure on fisheries as worldwide demand for fish continues to rise. Aquaculture is a growth industry for Maine. According to Belle, aquaculture as a whole is the second most valuable fishery in Maine, right behind the iconic lobster. Maine’s cold water, Belle said, is ideal for fish production, and the state’s clean environment and close access to markets has allowed Maine producers to fetch as much as 10 to 15 percent more than competitors. “It’s an exciting time” for the aquaculture industry in Maine, Belle said, because more young people and many fishermen from Maine’s traditional commercial fisheries are starting aqua farms. The state’s aquaculture industry also is diversifying. Seaweed and scallops are just a couple of the new areas Maine aqua farmers are exploring. Some companies are even exploring land-based fish farms for salmon and yellowtail, although none have gone commercial yet, Belle said.